Jyothika's Kaatrin Mozhi Single Song is Out Now! Kaatrin Mozhi directed by Radhamohan starring Jyothika and Vidharth in the lead roles. This movie is a women oriented film where Jyothika is known for versatility. A single from the movie named 'Kelambitaale Vijayalakshmi' has released now. Jyothika entertained us by proving herself in women oriented films like Magalir Mattum and Naachiyaar recently. The single is viral among all the women and the expectation for her next Kaatrin Mozhi has increased. A.H.Kaashif, nephew of A.R.Rahman has scored music in this film. Madhan Karky has penned the lyrics for the whole album in this film. The teaser of the movie have been sensational and let's keep our fingers crossed and watch how it attracts each and every hardworking woman out there! >>Kaatrin Mozhi - Sneak Peek 03! 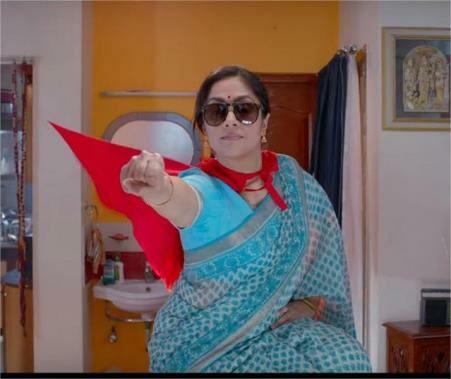 >>Jyotika's Kaatrin Mozhi - Sneak Peek 02 Is Here! >>Suriya's Sweet Message To Jyothika! >>STR's New Viral Video For Kaatrin Mozhi! >>Unexpected heroine for Karthi's next! >>Dazzling Galatta Debut Awards this weekend stay tuned!